euphoRHEA: Oye Kake! A Very Good Reason to Balle Balle! 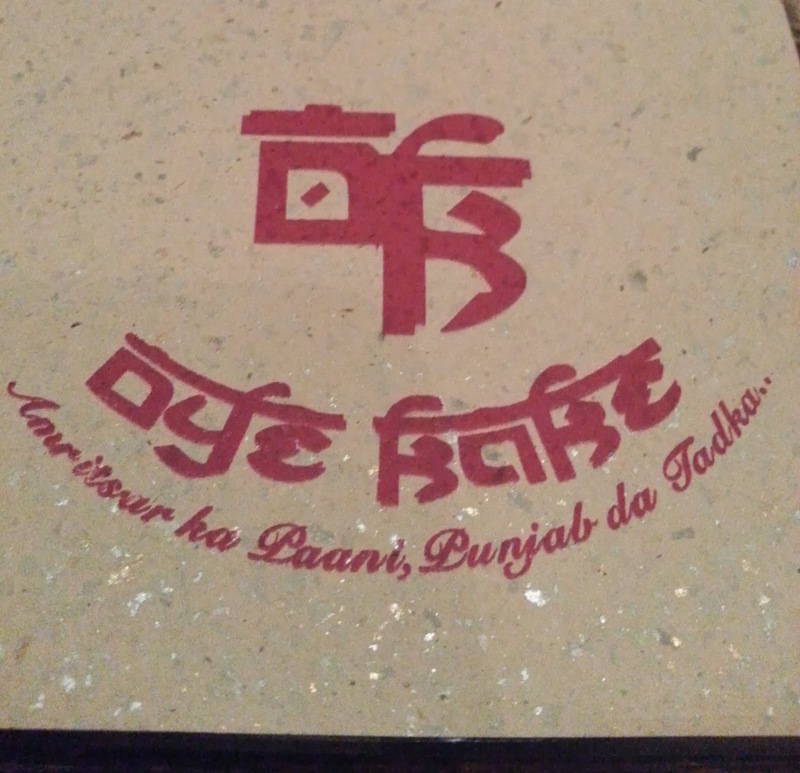 The hubby has been wanting to take me to this Punjabi restaurant for more than a year, and hold your breath, it's a vegetarian place! Now everyone knows that K strongly believes that eating vegetarian and then having to pay for it is like a crime against humanity, so this place must have SERIOUSLY impressed him with the food. Now there were two hurdles in the way of getting me over to Oye Kake. 1- getting me out of Kharghar and into South Bombay. 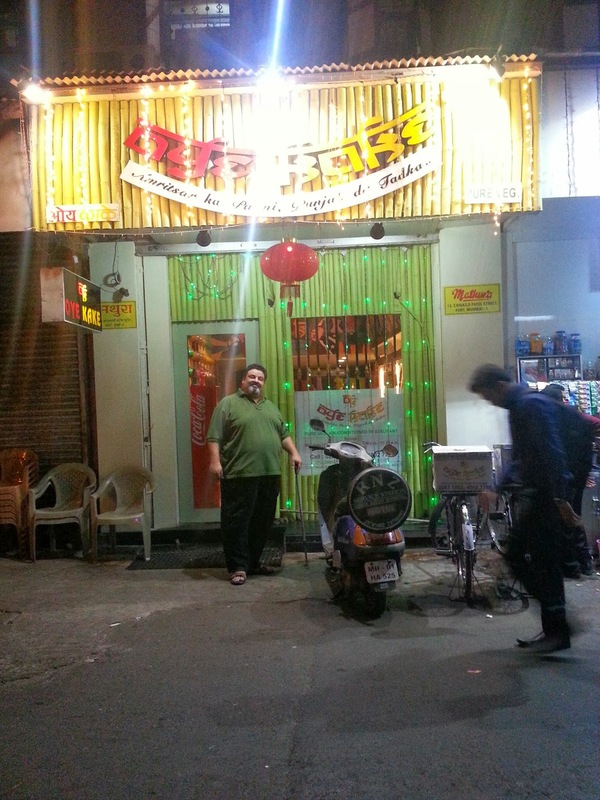 2 - Me being in South Bombay and willing to forgo a meal at Ling's. Somehow on that evening both hurdles were successfully passed and I was duly brought over to Oye Kake, which is a couple of shops down the lane from Yazdani Bakery. 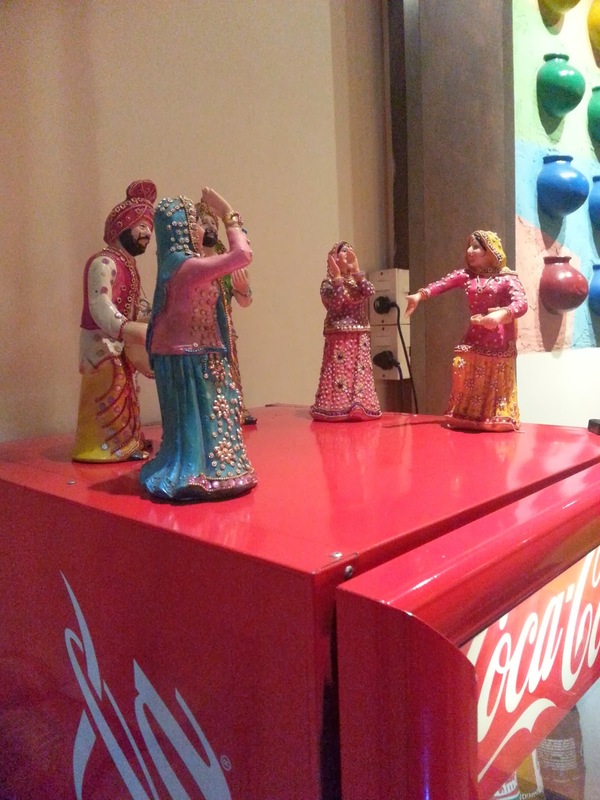 The restaurant is replete with kitschy Punjabi decor - parandis hanging from the windows, painted matka pots stuck to the walls, bhangra dolls on the soft drink chiller, phulkari embroidered table cloths, and bright colours every where. Steel plates and glasses that you see at a dhaba on the tables and a lot of Punjabi themed murals and photographs on the walls. The ambience is bright and cheerful. 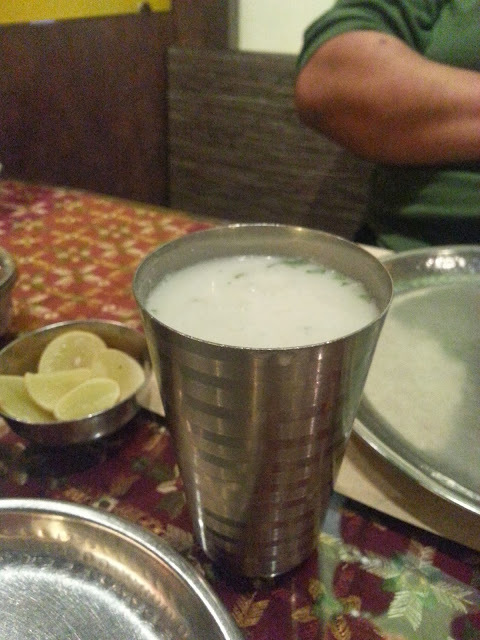 The owners used to import water from Amritsar for use in the cooking originally. I don't know if that is still true but it sounded like an interesting and quirky tidbit of information. 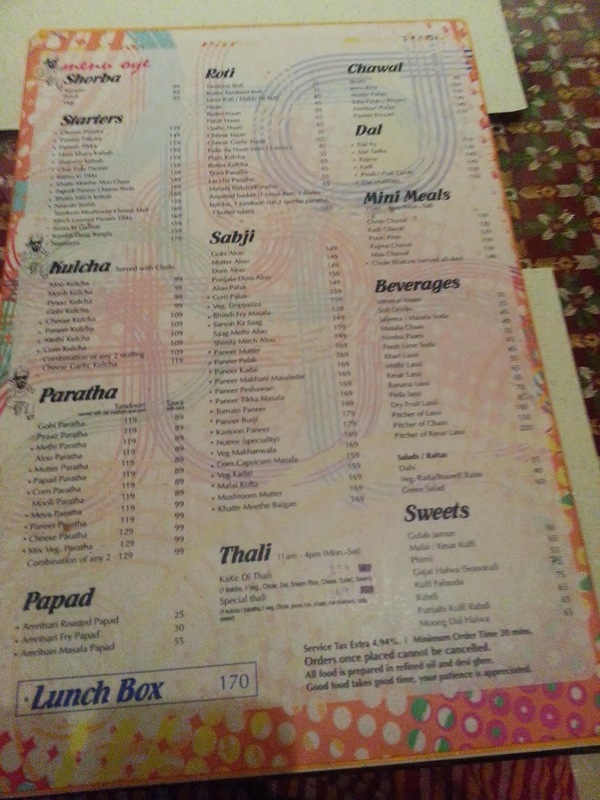 The menu card is huge in size and offers quite a wide range of options including mini meals that are aimed a the day time office crowd. To put it simply the dinner was an absolute treat. 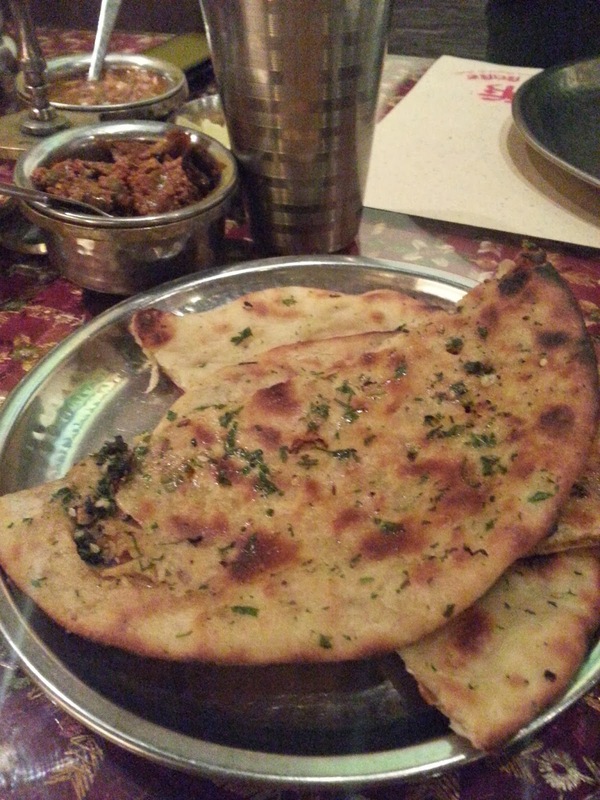 I chose the aloo pyaaz parathas with daal makhani. I also ordered a portion of aloo gobhi - cauliflower and potatoes. 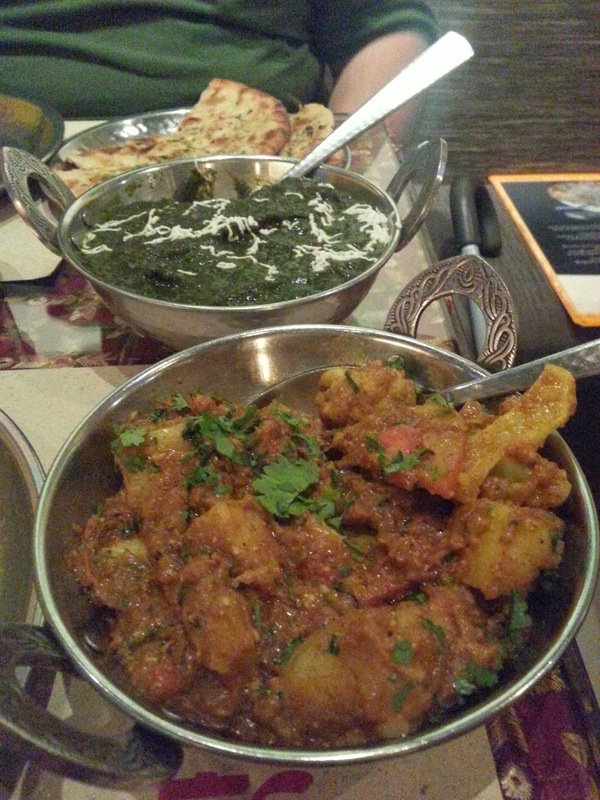 K said the paneer palak here is really amazing and he chose kulchas to go with it. We shared a portion of gulab jamuns for dessert. The meal was faultless. I would go back in a heartbeat. Flavourful but not chilli-hot, and surprisingly light on the stomach, the food at Oye Kake totally impressed me. I'm sure I would eat the same kind of food if I were to be in someone's house in Amritsar. What I really liked was that there was no thick heavy oily gravy, no layers of oil floating on top of the dishes. Even the parathas and kulchas didn't leave an oily residue on the plates. That paneer palak was truly outstanding. There were tiny bits of ginger adding a nice bite to the palak - everything was not pureed to a paste, the gravy had texture. 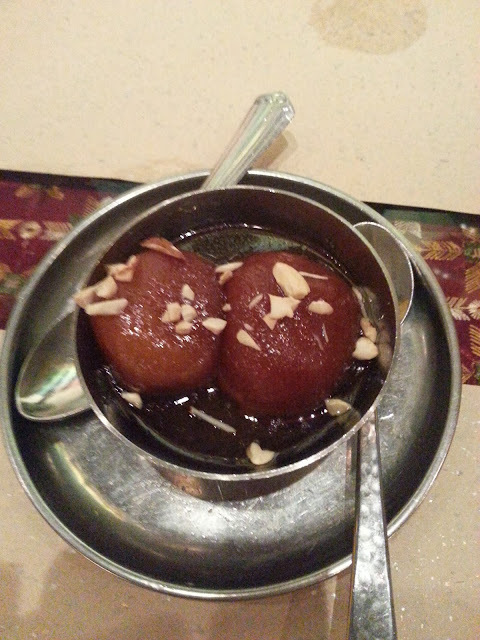 Here are the gulab jamuns.. soft and sweet! Our meal cost us roughly 700 bucks and it was worth every last paise spent here.